One of the fastest growing markets in the United States is the ever-expanding Marijuana industry. Most people in the U.S. associate it with drugs and negative spaces but in reality it is much more than that. Products like hemp granola, ropes and all sorts of other products can be manufactured out of hemp and if the market expands then there will be even more items to find uses for/create marijuana products out of. According to an article from Forbes the market is supposed to generate more jobs than manufacturing by the year 2020. Many people are calling it the “green-rush” because everyone that can is trying to enter the market in search of possibilities to make money. Of course, in a saturated market it pays off for you to stand out because you no longer look like everyone else, but it has to be done right. There are all sorts of marijuana businesses ranging from marijuana dispensaries to medicine research or smoke shops. Any promotional product that is going to represent your company/business has to be crafted to perfection or else it can backfire and make your brand look bad. We truly believe that. We are dedicated to creating the best promotional products any person has ever seen so we manufacture everything with great care and attention to detail. What kinds of solutions do we offer? We offer many different types of promotional products ranging from simple banners to very complex tent systems. You might need a simple addition to your outdoor marketing arsenal or a larger solution that will attract people’s attention to your location. 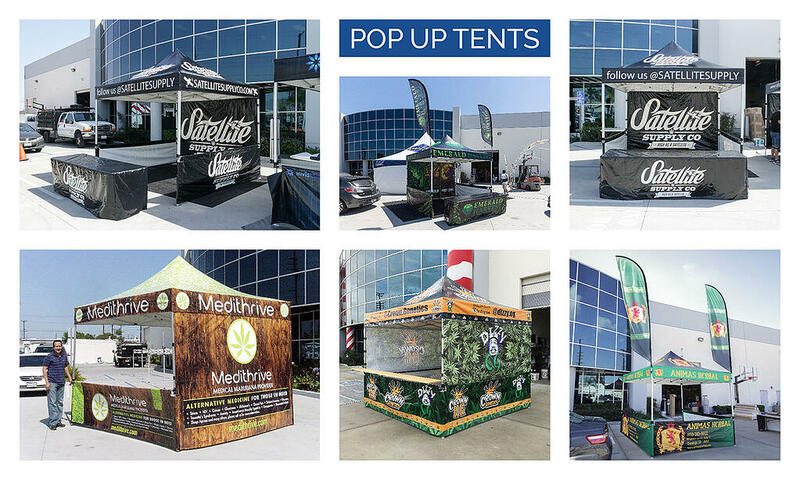 The most common outdoor marketing tool is the pop up canopy. This is because they are very versatile, easy to transport and install. Following our canopies in popularity are our inflatables. You can install an inflatable without breaking a sweat because they are very straightforward. You plug it in, tie it down and turn it on. Finally, our third promotional item we offer is a frame tent. The most common ones are standard frame and high peak tents. Now, we do offer all of these items in a simple and clean standard color design but they can all be further customized with printing and hardware changes. We can accommodate and customize hardware on a tent to look, function, and fit in any specific dimensions you might need. Not only that, but we actually manufacture custom tents in many different ways. We have frame dome tents, truss system tents (we did an Adidas tent that looked gorgeous), and even inflatable tents. When we mean custom we don’t just mean printing like every other company. We truly mean custom. Our customizing abilities apply to every single one of our products, not just tents*. 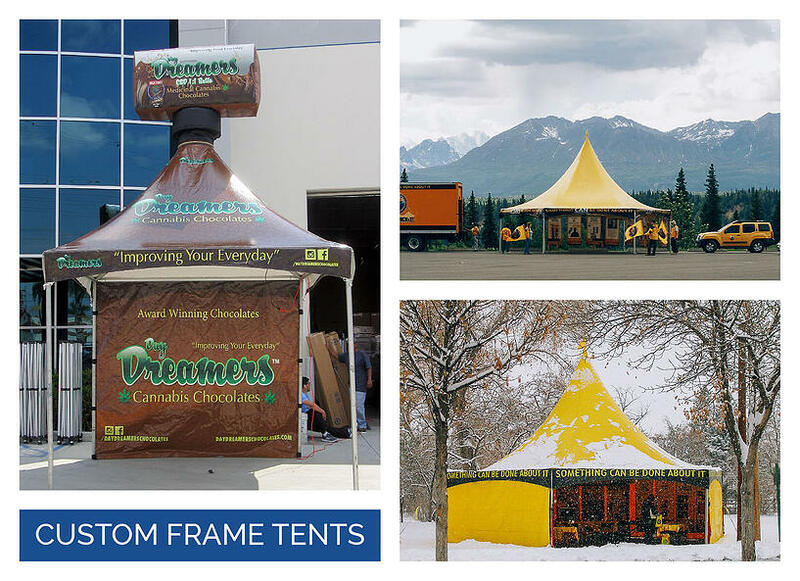 Frame tents are semi-permanent structures that tend to be really large. They can be small if they need to be more permanent structures than canopies. This is because the frames are a whole lot sturdier, but they are not as easy to transport or store. The poles are usually big and they do not bend (should not bend) or else the structures’ integrity will be compromised. You can host larger events in these tents because they are roomy. You also do not have to worry about wind as much, but we still recommend that these tents be removed when winds exceed 20 MPH. Regardless, we are sure to have something for everyone. We know that everyone has different needs but we are also the best tent customizers in the country and we know that our inventory is more than qualified to meet your needs. We also manufacture many different types and varieties of inflatables. They can range anywhere from inflatable replicas to inflatable characters or even custom designed inflatables. 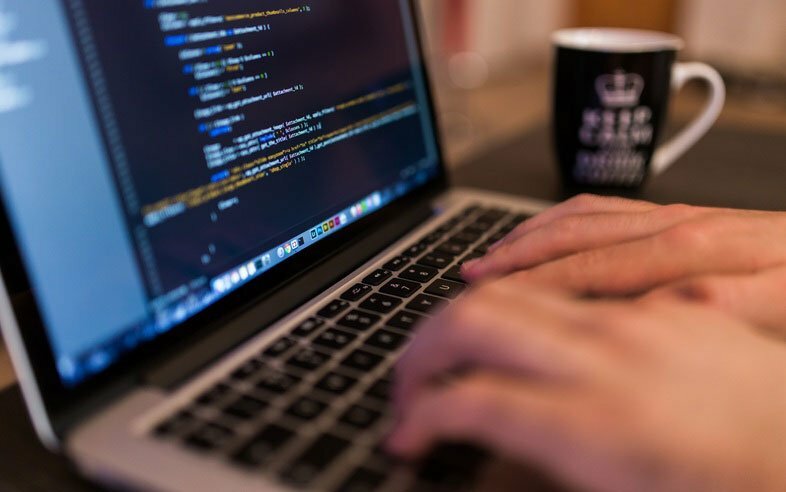 We have had customers come in and ask for something that has never been done before and we are always excited to have these challenges because our engineering/design team loves a good challenge. One example we can give of a challenge/feat is a giant 60’ tall cranberry we manufactured for Oceanspray. They were rolling out a new drink, some kind of infusion drink, and they needed to promote it at the beach. So aside from buying tents and all sorts of other promotional products they also wanted something massive. Now when we say massive we mean massive. It was our largest creation yet and we are very proud of it.